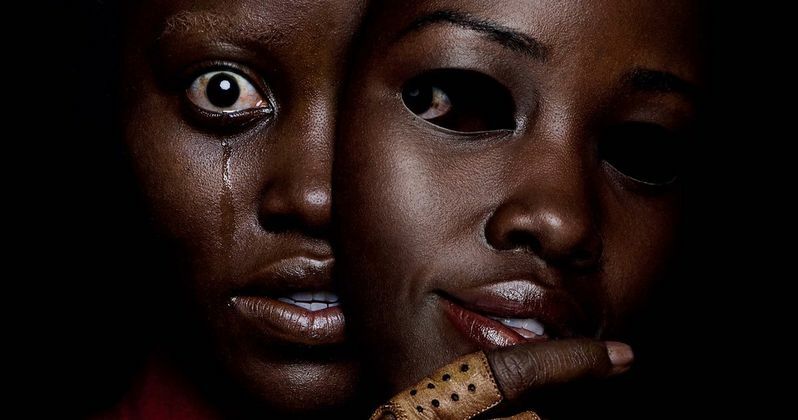 Jordan Peele's Us screened for the first time yesterday evening at the annual SXSW film festival and the first reactions are in. Many have been wondering how Peele was going to follow up 2017's Academy Award winning Get Out and how it was going to stack up. According to the early reactions, you can't really compare the two, which definitely sounds like a good thing. When talking about the movie before its release, Peele revealed that he wanted to make more of a straight up horror movie this time around. From the sounds of things, he did that and even more. Us focuses on a family's vacation that ends up going horribly wrong. The movie stars Lupita Nyong'o, Elisabeth Moss, Winston Duke, Anna Diop, Shahadi Wright Joseph, and Yahya Abdul-Mateen II. Now that the movie has screened for some lucky SXSW attendees, we have a better idea of what we're all going to be in for when the movie premieres. Awards Circuit's Clayton Davis had this to say about Us. "Jordan Peele's Us is a horror masterpiece. We are witnessing the birth of our modern day Hitchcock. 20 years from now we will ask one another what our favorite Peele film is & you will get 10/12 different answers. Incredible performance from Lupita Nyong'o!" Us has also been called "terrifying" and "confusing," but in a good way. Many of the first reactions indicate that repeat viewings are necessary to fully grasp what Jordan Peele has brought to the table with his latest offering. In addition to being terrifying, Us also includes moments of laughter, quickly followed by screaming, which sounds pretty intriguing. One early reaction goes as far as to call Peele the next Steven Spielberg. While Us screened last night in Texas, it won't be out for the general public until March 22nd. With that being said, the movie will be getting the IMAX and Dolby Cinema release treatment for the ultimate viewing experience. Usually, big blockbuster movies with insane special effects are the projects getting the special screen treatment, but Us and other Blumhouse releases are starting to get into these theaters in an effort to "keep content on screen fresh," according to IMAX CEO Richard Gelfond. Usually, these slots would go to re-releases. From the sounds of things, Jordan Peele has created something fresh and original again with Us. Thankfully, we all don't have to wait too much longer to see it, since it will be out in a few weeks. After the movie hits theaters, Peele's reboot of The Twilight Zone premieres April 1st on CBS All Access, which he produces and hosts. He is also producing a remake of Clive Barker's horror classic Candyman. You can check out some of the early reactions to Jordan Peele's Us below, and look into ticket and theater information over at Universal Pictures.